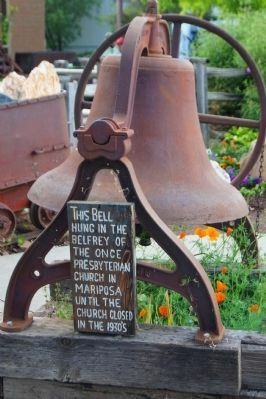 The first meeting of the Mariposa County Historical Society was held April 14, 1957. 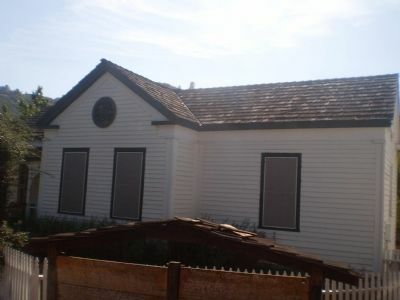 In 1958 the museum was established at the Historic Masonic Lodge located nearby. 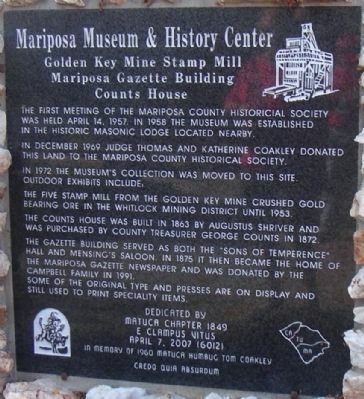 In December 1969, Judge Thomas and Katherine Coakley donated the land to Mariposa County Historical Society. 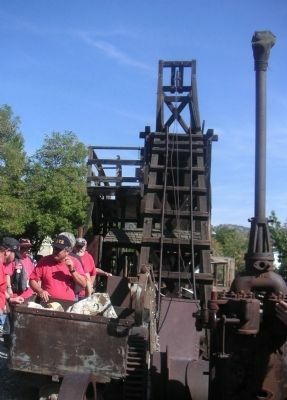 The five stamp mill from the Golden Key Mine crushed gold bearing ore in the Whitlock Mining District until 1953. 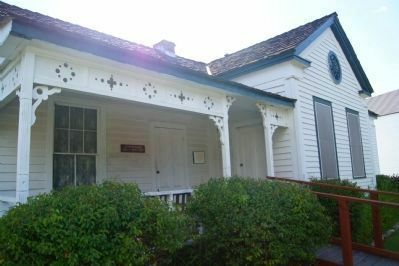 The Counts House was built in 1863 by Augustus Shriver and was purchased by County Treasurer George Counts in 1872. Marker sits to the right of the entrance to the museum. 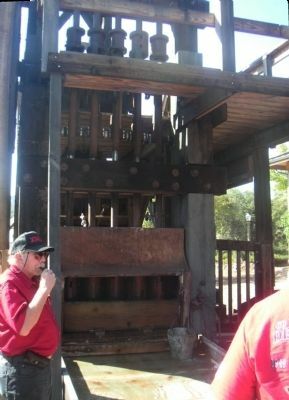 A stamp mill cog is built into the base of the monument. 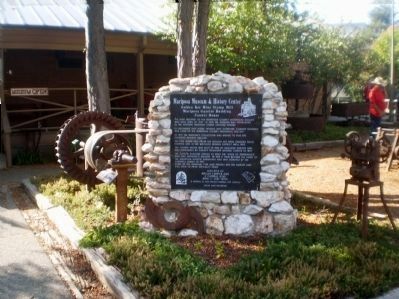 The monument is surrounded by various old pieces of mining gear. 2007 by Matuca Chapter 1849, E Clampus Vitus. Location. 37° 29.367′ N, 119° 58.25′ W. Marker is in Mariposa, California, in Mariposa County. Marker is at the intersection of Jessie Street and 12th Street, on the left when traveling north on Jessie Street. Touch for map. One block west of Highway 49 at 12th Street in downtown Mariposa. 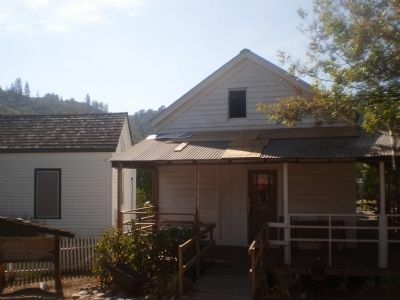 Marker is at or near this postal address: 5119 Jessie Street, Mariposa CA 95338, United States of America. Touch for directions. Other nearby markers. At least 8 other markers are within walking distance of this marker. A Shrine to Justice in California (approx. 0.2 miles away); Mariposa County Court House (approx. 0.2 miles away); a different marker also named Mariposa County Court House (approx. 0.2 miles away); Mariposa County Courthouse (approx. 0.2 miles away); Mariposa Independent Order Odd Fellows Hall (approx. 0.4 miles away); Fremont Adobe (approx. half a mile away); Schlageter Hotel (approx. half a mile away); Mariposa County’s Old Stone Jail (approx. half a mile away). Touch for a list and map of all markers in Mariposa. More about this marker. Museum grounds include the Gazette Building, the Counts House and the 1800's stamp mill. In 1979 the Holy Cross Catholic Church building was moved here from Indian Gulch. It was distroyed in a fire in the 1980's. 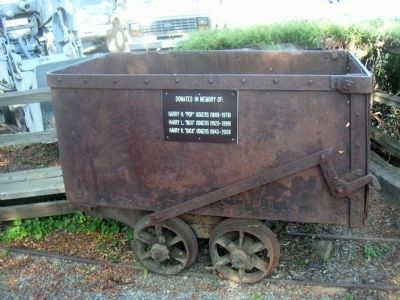 A large buckboard wagon and a logging wagon (with a massive log on it) sit in a small park between Jessie and Highway 49 directly in front of the museum and can be seen from Highway 49. Regarding Mariposa Museum and History Center. Photography is not allowed inside the museum. 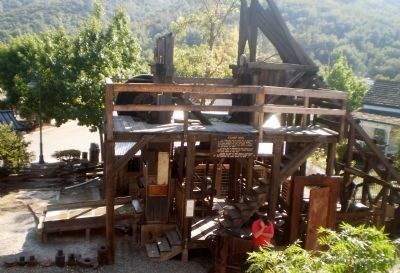 View is of the stamp mill from the second story of the museum. After the Gold Rush many Chinese were employed at 25¢ per day clearing fields and using the rocks to build fences. These rocks are from a fence on the Walter Palmer Ranch in Cathey's Valley. Rebuilding on this site was done by youth from the nearby C.Y.A. Camp, under the direction of James Hibpsham. The Gazette building is still being restored at this time. View is of the stamp mill from the back where the conveyor belt carried ore up to the hopper. View is from behind stamp mill showing the canvas belt and wooden gear. View from the front showing the 5 massive stamps. 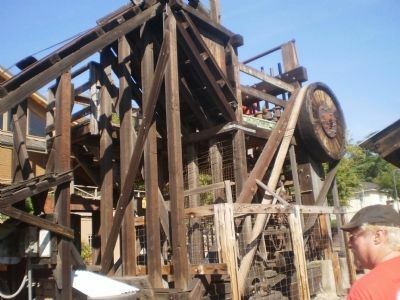 A demonstration run of the stamp mill on this date turned 150 pounds of granite and quartz ore into a muddy silt, finer than sand in just a few minutes. 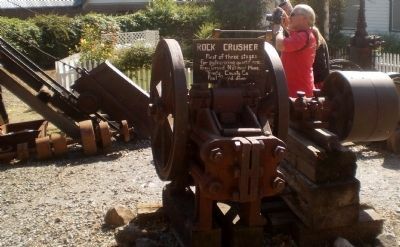 Donated in memory of Harry Odgers, all 3 of them who were essential in getting the stamp mill errected and in working order. 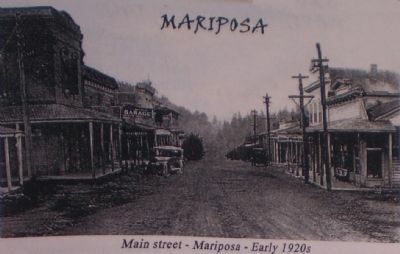 Street scene from downtown Mariposa in the 1920's. 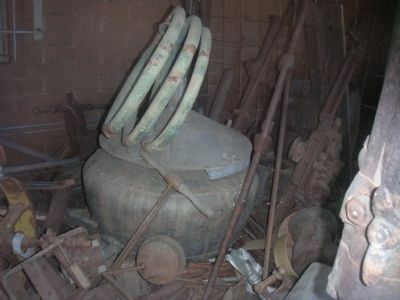 Sitting among mining tools and implements outside the museum is this copper distiller....unknown if was it used for mining purposes, or for other purposes. 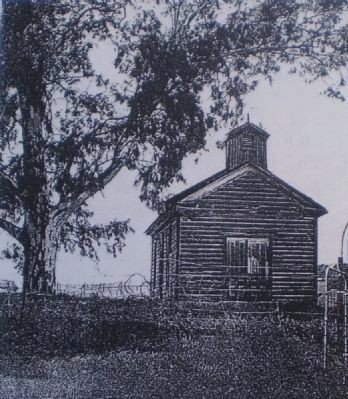 The Holy Cross Catholic Church served the town of Indian Gulch until the town members drifted away. 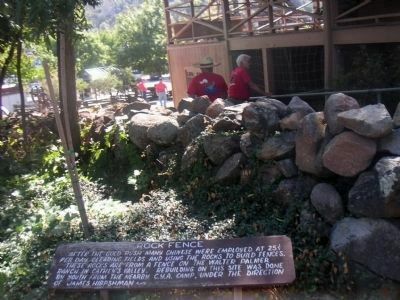 An attempt was made to save the church and it was moved to the Mariposa Museum and History Center in 1973. A fire in the 1980s destroyed the church that so many had tried to save. 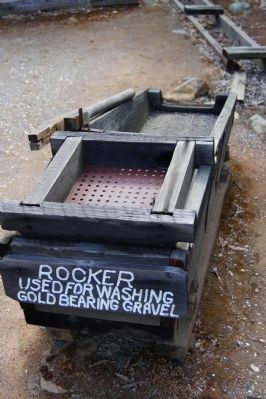 Used for washing gold bearing gravel. More. 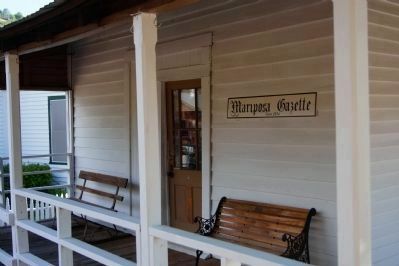 Search the internet for Mariposa Museum and History Center. Credits. This page was last revised on June 16, 2016. This page originally submitted on December 3, 2010, by Lester J Letson of Fresno, California. This page has been viewed 1,265 times since then and 11 times this year. Photos: 1, 2, 3, 4, 5, 6. submitted on December 3, 2010, by Lester J Letson of Fresno, California. 7. submitted on June 24, 2014, by Mia Kostouros of Los Banos, California. 8, 9, 10. submitted on December 3, 2010, by Lester J Letson of Fresno, California. 11. submitted on June 22, 2014, by Mia Kostouros of Los Banos, California. 12, 13, 14, 15, 16. submitted on December 3, 2010, by Lester J Letson of Fresno, California. 17, 18. submitted on June 22, 2014, by Mia Kostouros of Los Banos, California. • Syd Whittle was the editor who published this page.